Recently a friend of mine, Tony Wood, wrote a book. When I heard, I really felt that I should – in the words of Skepta – celebrate that. Tony works at the New Left Review and his book is called Chechnya: the Case for Independence. I’m still just reading some of the gloriously granular first few chapters, which detail the historical and ethnic make up of the region. So for a broader overview of the book, here’s Tony’s response to some questions. Martin: To provide some introductory context, can you give a quick outline of Chechnya - population size, ethnic make up, neighbours and key allies/opponents etc? Tony: Chechnya is roughly half the size of Wales, and has a population of around a million – owing to the conflict, there are no fully reliable census figures. It can roughly be divided into three geographical areas – flat plains in the northern third, rolling hills and fields in the middle, and high, snow-capped mountains in the southern section. The Chechens have inhabited the region for several thousand years, and have long made up the vast majority of its population – currently over 90 per cent. They are one of a patchwork of ethnic groups inhabiting the North Caucasus, who all have a complex set of historical experiences and mutual interactions; briefly, one can say that the Chechens are the most numerous of these small peoples, which has meant they have tended to take a lead role in resistance to Russian rule over the centuries – a stance which has earned them both admiration and resentment among their neighbours. Their closest kin are the Ingush, whose homeland lies immediately to the west of Chechnya: the Ingush and Chechens speak very similar languages, and are bound by many clan and family ties. The Chechens’ main historical adversaries have been the Cossacks, who began to settle in the region in the sixteenth century. M: Russia has lead two onslaughts on Chechnya since 1994 that have cost 70,000 lives and have now occupied the country for almost eight years. Given the extent of bloodshed in the region, what factors would you attribute to the comparatively small coverage the struggle receives in the UK media or on international political stages? T: The lack of media coverage stems, I think, from a combination of several factors. Firstly, much of what Western reporters and media organizations learn about Chechnya is filtered through the Russian media, which have had much less access to the republic since 1999, compared to the 1994-96 war; the Russian authorities have kept a much tighter grip on access to Chechnya for both Russian and foreign reporters, making it much harder to report on events first-hand. The second factor is Realpolitik: Western governments have on many occasions decided not to pressure or criticize the Russian authorities about what is happening in Chechnya, owing to a range of concerns: oil, gas, NATO, the need to avoid a Russian veto in the UN Security Council, and so on. The media have often fallen into line with their governments’ choice of priorities. The War on Terror has in most cases simply amplified an existing willingness to sideline the Chechens: the US and European governments have largely accepted the Russians’ portrayal of Chechen separatists as terrorists. M: "The Chechens have as much right to a state as any other people, and that their moral case for sovereignty is an increasingly strong one." Can you summarise the key elements of the case for those who haven't yet read the book? T: I start from the principle that all peoples have the right to national self-determination – to form themselves into states on the basis of shared identity, language and historical experience. This is enshrined in international law, in the UN charter, and is the formal basis for international relations between currently existing sovereign states. This principle applies to the Haitians as much as to the French, to Fiji as much as to China, and my main argument is that there is no reason why it should be denied to the Chechens. They elected pro-independence presidents by large majorities in democratic elections in 1991 and 1997, and put up strong resistance to Russian military invasions to restore Russian rule in 1994-96 and 1999 to the present. Their desire for independence is clear; so why shouldn’t they have it? The second main strand of the book is to analyse the arguments that have been used against Chechen independence. These focus on Russian concerns that every other ethnic group in Russia would then seek to secede, as well as strategic worries about control over the Caucasus and its oil pipelines. I try to show that these arguments are on shaky ground: none of the other ethnic republics of which Russia consists have pushed for independence, and certainly none would actively seek it now, given the bloody example that has been made of Chechnya. As for the strategic dimension, the Chechens have long insisted they would not seek to join NATO or even establish a separate currency: they would want to retain many of the ties that at present connect them to Russia, but within the framework of relations between two sovereign states. These demands are modest; the Russian response has been utterly disproportionate. Though much of my case for Chechen independence rests on international law and the principle of self-determination, I also feel that there is a strong moral case for independence: given the suffering that has been inflicted on the Chechens, it is very hard to imagine them willingly and happily remaining part of a state that has caused them such harm. This moral aspect of complemented by one from the Russian side: the war is needlessly killing a lot of young Russian men, and has helped create a climate where violence and xenophobia are officially tolerated or even encouraged. Independence for Chechnya is the best way of ending the war, which is in the interests of both peoples. 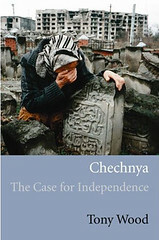 M: From the title - Chechnya: the Case for Independence - onwards, the book sets itself out as quite partisan. Were you never concerned that by taking such a firm position, some of the strength of your arguments might be undermined? T: I don’t think partisanship is anything to be afraid of, especially in cases where such manifest injustice has been done to one of two sides. Moreover, even though there are two sides in both the argument about independence and the war itself, it would be misleading to discuss the conflict as if these two sides were equal. The official Russian line is solidly entrenched, shared by governments and media organizations across the world, and (consequently?) by much of the public in Russia and beyond. I felt the real need was not for an even-handed middle course, but for this total imbalance to be at least partially redressed. And actually, I don’t even think there is a middle course here: either the Chechens have the right to an independent state or they don’t. Many people are of the latter opinion, I am of the former; the more clearly I set out my position, the more honestly its implications can then be discussed. M: Being a Russian speaker but London based, how do you go about researching a book on Chechnya? How far did you find modern telecommunications (especially telephone, email and the internet) got you before you felt you were required to meet people in Chechnya in person? T: The book is essentially an analytical one, rather than containing any direct testimony or reportage, so in a sense, though I learned a lot from visiting Chechnya, it didn’t feed directly into the content of the book. Most of my work was done in libraries and through using books, documents and media reports -- and London is quite a good place to be in all those regards. M: How come there is "no fully reliable system for transcribing Chechen?" M: Chapter 6 of your book presents an a "historical picture of the role of Islam in Chechnya, stressing the interweaving of national and religious identity in local traditions, and the mobilizing function of Islamist discourse during confrontations with external forces." Could you provide a brief overview of these themes? T: The Chechens converted to Islam in a gradual process stretching from the 17th to 19th centuries. It was predominantly the mystical Sufi tradition of Islam that they embraced, combining it with remnants of their own pagan traditions (the Chechen word for God is not Allah but Dela, after the main god in their pre-Islamic pantheon). The result was a very particular fusion of Islam and local practices. Since then, the relative weights of local specificities and broader Islamic orthodoxy have fluctuated, in large part in response to external pressures. In the mid-19th century, the Dagestani Sufi preacher Imam Shamil led a guerrilla war against the Russian Empire for 20 years, using a more strict interpretation of Islam as a unifying, disciplining force. After that, different strands of Sufism alternately took the lead in opposing outside rule, and over the years, religion came to be interwoven with local and ethnic identities. This complicated set of relationships was given a new twist by the wars of the 1990s. The Chechens found themselves isolated, fighting the Russians almost alone – except for a stream of Islamist fighters arriving from Afghanistan and the Arab World. These fighters were small in number, but militarily very experienced and proficient, which gave their orthopractic form of Islam a lot of prestige. Their highly ascetic form of Islam also contrasted with the weight and complexity of Chechen traditions, which was for many young people an attractive contrast. There is also the fact that the Chechen separatists have had few financial backers except religious organizations in Saudi Arabia and the Gulf: many Chechens began to adopt Islamist discourse either as a matter of preference or of expediency, to secure funding. In sum, the picture is a great deal more complex than is often admitted. Russian propaganda speaks of a battle with international Islamic fundamentalist terrorists, who have infested Chechnya and turned the Chechens against Russia. The reality is that religion has long been a key component of Chechen identity, and the Islamic dimension of the conflict cannot be entirely separated from the national one. Moreover, the quantities and degree of influence of foreign fighters has been overstated: this is a Chechen struggle with some outside participants, rather than the other way round. M: Have there been any similar conflicts that might provide precedent or insight to positive steps towards a permanent resolution of the situation between Chechnya and Russia? T: It is very difficult to find comparisons, not least because every situation is historically so specific, and every place so different. But I think there are other cases we could be looking at, if only to grasp what is particular to Chechnya, and where the real difficulties lie. Firstly, and most obviously, there is Israel/Palestine: a complex and emotive question for many people. In my opinion, the real stumbling block to peace is not Palestinian ‘terrorism’, but Israel’s refusal to acknowledge the Palestinians’ right to a viable sovereign state. This is a bad precedent the Russians seem bent on following in Chechnya – and whose appalling results should make them reconsider. Another example would be East Timor, a former Portuguese colony seized by Indonesia in the 1970s, which waged a long war of liberation before finally being granted independence in the 1990s. It took a long time, and required international involvement (Australian peacekeepers, for instance), but the Timorese now have a state of their own, and a seat at the UN. Similarly, the Eritreans fought for decades to separate from Ethiopia, and finally managed to gain international recognition in 1993 – though in his address to the UN, the Eritrean delegate had harsh words for the ‘international community’ that had for so long refused to help them. Neither Eritrea nor East Timor is a paradise, of course, and they both have considerable internal problems, not all of which are a consequence of decades of war; but they are examples of long-suffering peoples finally being granted what they fought so bitterly for, against the odds and against the received wisdom of the day. The lesson to be drawn from them is that although self-determination can run counter to a lot of large vested interests, and seem impractical or even destructive in the short term, it is often the only way to a just and sustainable peace. New Pitchfork column featuring Joker, Surya Dub, Sub Swara, Skepta, Scorcher, Durrty Goodz, and DMZ v Dubwar. Joker's next level, trust me... and Pinch... and Plastician... and Kode9. 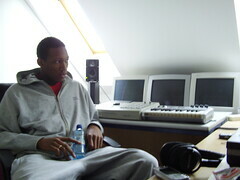 Trim's back: with the best grasp of language in grime, we've missed his bars deeply. 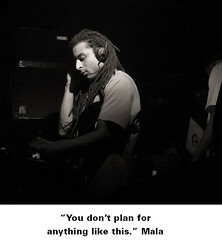 Get with it or get lost. I've been holding my breath since before Christmas, but it's finally out: my full 2,500 word feature on DMZ in Dummy Magazine. Dummy mag is in shops now. They also offer their mag as a free pdf podcast through iTunes or available through their site (hit the pdf podcast link at the bottom of their site ).